alaTest a collecté et analysé 42 avis de consommateurs et d'experts pour le produit Russell Hobbs Platinum Grind And Brew 14899 Filter Coffee Machine with Timer - Black / Brushed Steel. La note moyenne du produit est 4.6 sur 5, tandis que les autres produits de même catégorie ont une note moyenne de 4.4 sur 5. Les testeurs apprécient la qualité de construction. 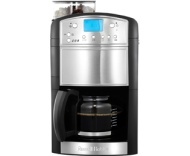 Après analyse des notes de consommateurs et d'experts, de l'âge du produit ainsi que d'autres facteurs, et comparé aux autres produits de même catégorie, le Russell Hobbs Platinum Grind And Brew 14899 Filter Coffee Machine with Timer - Black / Brushed Steel obtient un alaScore™ de 87/100 = Très Bien. "Simple to make tasty coffee. Although I have not tried the timer function. Easy clean. Coffee easy to make strong. " "What a great product, it's so easy to use and clean, and produces great coffee. Very pleased with this product "
"Simple to use. Just trying to get the ratio of ground coffee to water! But great product!" "bad investment, the coffee is just water, can't be set the number of cups, "
"I have recently got a new found love of coffee and this machine means I can enjoy it in all its glory ??" "Very good machine great coffee easy to use good value for money - glad I bought it"
"Takes a bit of getting used to and finding the right beans takes time but I' m sure when I do it will be great. It's quick and makes a hot coffee. Not too noisy and a good looking machine that doesn't take up too much space." Takes a bit of getting used to and finding the right beans takes time but I' m sure when I do it will be great. It's quick and makes a hot coffee. Not too noisy and a good looking machine that doesn't take up too much space.